King George VI and Queen Elizabeth enter Woodbine Race Course for the 1939 running of the King’s Plate horse race. This was the first time a reigning monarch had attended the race which was originally named the Queen’s Plate in honour of Queen Victoria. Thousands of people were on hand to welcome the royal couple as they made their way to the race. Photo: Toronto Public Library Archives. Eighty years ago in May of 1939, for one of the first times in Canada’s and Toronto’s history, a reigning monarch visited the city and the Beach area. 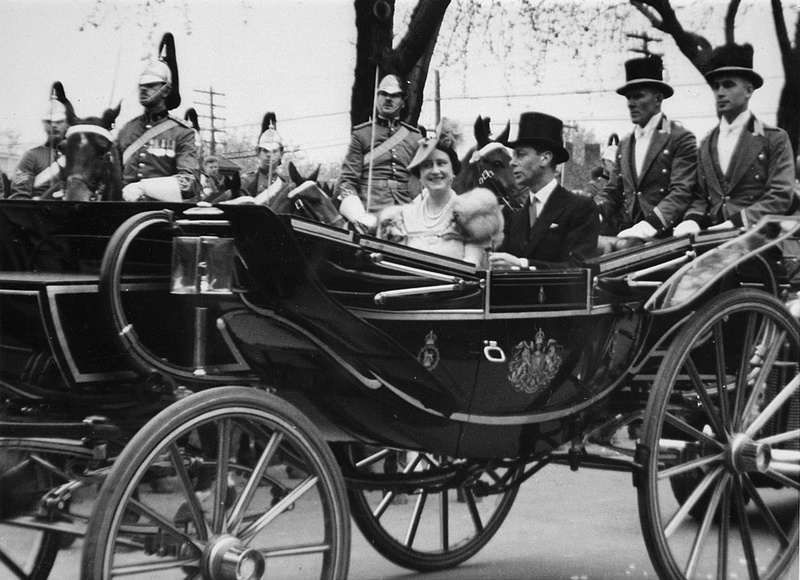 King George VI and Queen Elizabeth visited over the Victoria Day holiday in May of that year. This was an unprecedented event which gave the people of Toronto a chance to actually see the royal couple (the King and Queen of England) in their neighbourhood. Back in 1939, most of Toronto’s population was of British stock and they were solidly behind the British monarchy. There was a special tour done by the royal couple to include many of the different spots in the city such as veterans’ hospitals, City Hall, Queen’s Park and especially the Beach because it was home to the sports spectacle of the Queen’s Plate horse race. The Queen’s Plate was named in honour of Queen Victoria, but in 1939 was called the King’s Plate because the reigning monarch was male. The race took place at Woodbine Race Course in the Beach on May 22. It was the grandest event in the history of horse racing in Canada as the King and Queen attended for the first time. The royal couple were seen by tens of thousands of Toronto residents, and especially by the adoring people of the Beach as they waved to the large crowds on the way to and at the race. That was a once-in-a-lifetime experience for their adoring fans (as I call them). The people, officials, churches and politicians probably planned for this event like they never had before or would do again. Events were planned to include the most advantageous way to see the King and Queen. Boy Scouts and Girl Guides from all across Ontario as well as Toronto were determined to see the royal pair. There was so much planning and trying to get a glimpse of them, just for a wave. Religious groups, nurses, schools, stores, every group one can imagine, were all going to witness this great event. The route started at the Canadian Pacific Railway’s North Toronto station. The royal couple alighted from the train and into an open car that drove south on Yonge Street, stopping at a number of locations. They then went east on Bloor Street over the viaduct and continued east on the Danforth past Broadview Avenue. The crowds were tumultuous and were overwhelmed by the sight of the King and Queen who stopped a few times along the route. I could not even attempt to write about their trip; it would be nearly impossible. Finally, they came to the most crucial point – Woodbine Avenue. One must remember the east end of the city was probably the most patriotic to the British Crown and Empire, and they were especially so in the Beach. Travelling down Woodbine Avenue to the thousands of cheering people, the royal couple went by the most loyal church and oldest Anglican church in the Beach area – St. John’s Norway. There were so many people at Woodbine Avenue and Kingston Road, it was difficult for the royal couple to get to the opening of the race at Woodbine Race Course. In those days the entrance to the track was at the east end, at Queen Street and Woodbine. When the King and Queen finally arrived at the entrance, they disembarked from the automobile and went into the royal carriage flanked by the military and horse guards. They finally made their entrance to the most grand event Toronto and Canada had ever had. It was the King’s Plate, with tens of thousands of Torontonians and Beachers saluting the King and Queen. I will be writing more on this event which took place 80 years ago in May of 1939, but I want to know of anybody who may have been at this event and has any personal memories they would like to share. Is there anyone whose parents or relatives have recollections of the visit? I know that schools had special events in the Beach. For example, St. John’s Catholic School had a special event planned for the royal visit. I have a photo of a pageant that they did for the visit. The quality of the photo is poor and it will not reproduce well enough to be printed with this column. There were other schools, other events, other social gatherings, so please let me know. Remember, this was one of the most historic events in the Beach, so let us know if you can. Also, if anyone has any other memories of the royal couple’s visit anywhere across Canada, I would like to know. Write to me via the Beach Metro News.